NMTC performed Roger and Hammerstein’s Oklahoma! in October 2013 at The Cripps Hall Theatre, Northampton School for Boys. Because of its status as a classic musical it is easy for a society to present Oklahoma! in a lazy, lacklustre way in the expectation that it will always sell. And, candidly, my experience of amateur productions of shows like this has been disappointing. That’s a shame as Oklahoma! is still a very fine show with a good story, excellent songs, and themes that are still relevant to an audience the vast majority of whom were not born when the show was first produced. 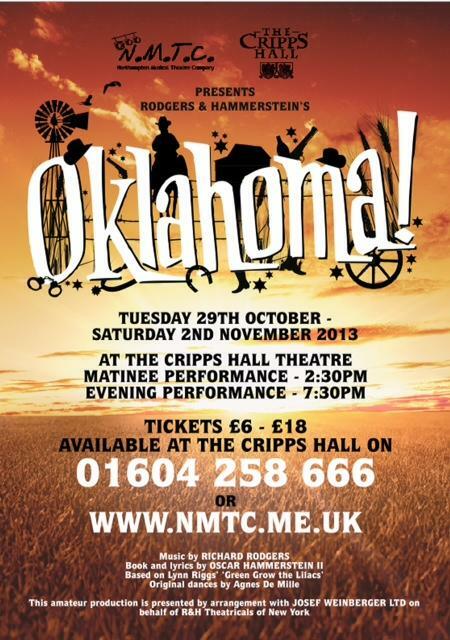 But I am very pleased to say that NMTC did Oklahoma! proud. This was an excellent show. There were some fine acting and singing performances from the principals who were well supported by the ensemble. I was impressed by Lisa Simpson as Aunt Eller, Dan Hodson struck just the right note as Will Parker and Matthew Berrill made a fine Curly. Katy Manning played Laurey with the right balance between a girl who is no pushover but who wants a good man in her life – in contrast to Ado Annie, played with wonderful comic skill by Beth Hodgson who was totally convincing as the ‘girl who can’t say no’. To make the character Jud Fry believable requires real acting skill in order to avoid a weird caricature and Jonathan Reynolds’ portrayal was absolutely right. There was a large chorus, all of whom were kept occupied throughout the show – in character all the time. Singing and dancing were of a very high quality. Choreography is clearly a forte of Martyn Knight, the director, and this showed in what I took to be demanding dance numbers especially as, at times, the whole cast of 40 were on what is really quite a small stage. Accents were consistent and diction was excellent throughout. A 13-piece orchestra, led by musical director Graham Tear did the score full credit. The set design was enhanced by the use of slides on a backdrop augmented with items of small, easily moved scenery on stage and this arrangement worked extremely well. The lighting design combined the practical and the creative very well. Costumes were appropriate and of good quality, with no corners cut. The whole piece clearly bore the hallmark of strong and intelligent directing and Martyn Knight (supported by an excellent team) is to be commended for producing such an entertaining Oklahoma! Having not seen “Oklahoma” for many years, I was really looking forward to this production… what a treat was in store for myself and the rest of the audience! N.M.T.C. presented an almost flawless opening night of one of musical theatre’s most loved musicals. “Oklahoma”, written by Rogers and Hammerstein, is a classic love story set in the Oklahoma Territory in 1906. The opening of the show was very original, there was a projection screen that showed the cast list, production credits, photographs of the company, and shots taken during rehearsal time. Whilst watching this, the orchestra played the overture of the show… a perfect start to a lovely evening. “Oklahoma” was well directed by Martyn Knight, the staging was excellent, the company was clearly well rehearsed and the show had a good pace throughout. The projection screen was in use during the entire show, to great effect, giving a classic musical a really updated “feel”. The musical direction by Graham Tear was superb, the vocals from both principals and ensemble were to a standard not often achieved in amateur dramatics. Graham has assembled an excellent orchestra with some very talented musicians. Well done! The choreography was very good throughout the show, in particular, the dream scene, which I thought was beautiful. There was a strong male ensemble, with some good dancers in their midst, which was very nice to see in an amateur production. There were some very impressive performances from the cast, most of the principals maintained their characters well and managed to keep their American accents throughout. Matthew Berrill gave a confident performance in the role of Curly and had wonderful vocals. Katy Manning who played Laurey gave a good performance and had a beautiful singing voice too. Jonathan Reynolds showed his brilliant acting skills in the role of Jud Fry and when he sang “Poor Jud is Daid” with Matthew Berrill (Curly) gave me my favourite moment of the evening. All the other principals played their roles extremely well, however, I must single out the two performances that I thought outstanding, these were Lisa Simpson as Aunt Eller and Beth Hodgson as Ado Annie Carnes, congratulations to both of you. The scenery and props were all well-made and effective, with the use of the projection screen and costumes that were in keeping with the period, this was visually an excellent production. Technically there didn’t appear to be any major problems, the lighting, sound and stage managing all worked really well. Congratulations to the entire company, both on and off stage for what was an excellent production of “Oklahoma”. I sincerely hope you all have a successful and happy run. Thank you N.M.T.C. for the wonderful hospitality shown to my guest and myself during our visit, I greatly look forward to seeing you again in the future.